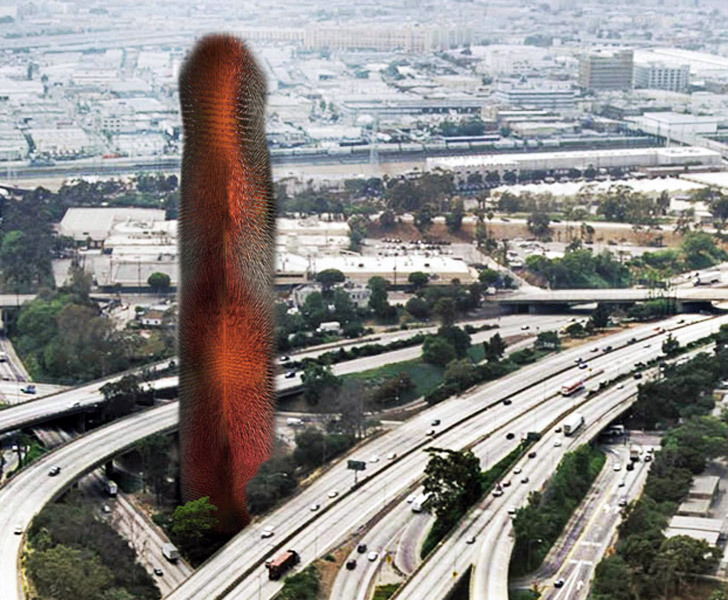 The <a href="http://www.evolo.us/featured/soundscraper-captures-sound-kinetic-energy-while-reducing-noise-pollution/" target="_blank">Soundscraper</a> is a futuristic structure designed to transform auditory vibrations from bustling cities into a source of clean energy. Designed by Julien Bourgeois, Olivier Colliez, Savinien de Pizzol, Cedric Dounval and Romain Grouselle, the Soundscraper is covered with noise-sensitive cilia that harvest kinetic energy while soaking up urban noise pollution. 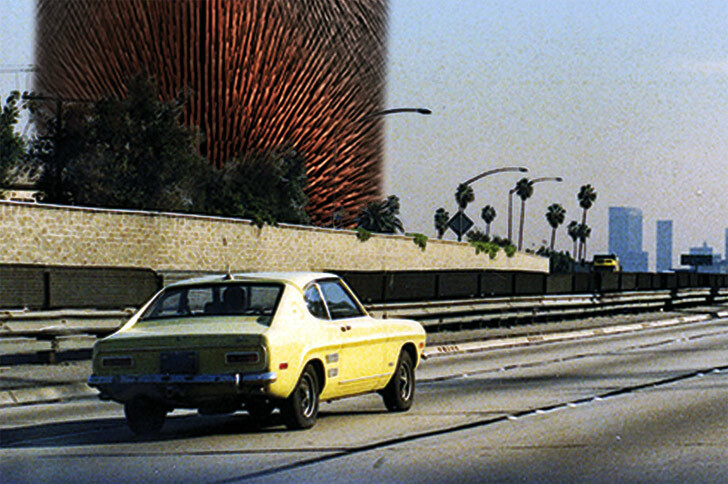 The soundscrapers would be constructed near major motorways and railroad junctions, prime locations for capturing ambient<a href="https://inhabitat.com/soccket-uncharted-play-unveils-an-energy-generating-soccer-ball/" target="_blank"> vibrations</a>. 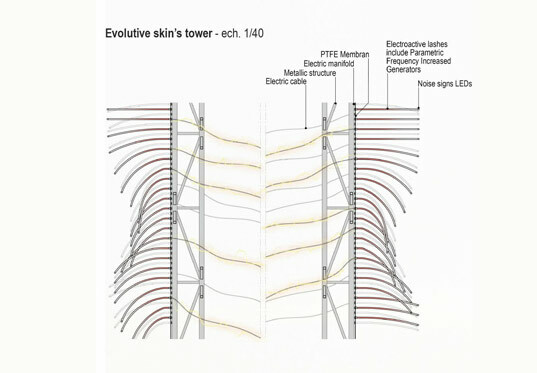 The sound-sucking material would cover the exterior of the tower with a double skin layer, held away from the façade on a metallic frame. 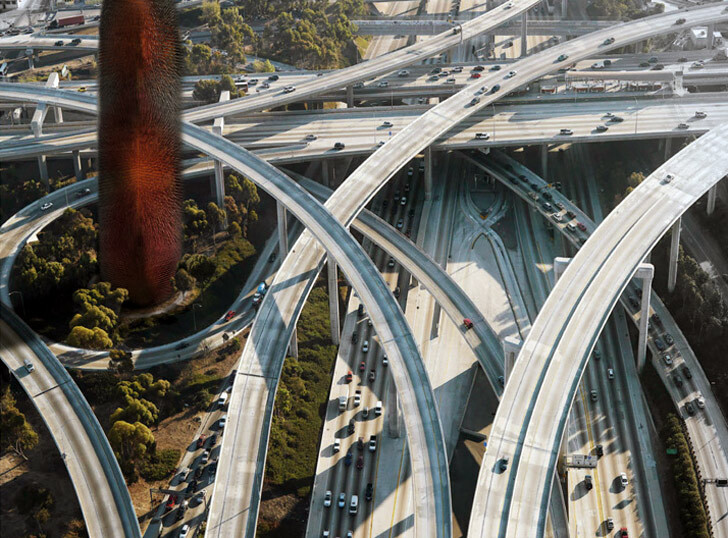 Electro active lashes cover the metal frame, and pick up noise from cars, trains, pedestrians and passing planes. Each of the 84,000 lashes is armed with sound sensors called Parametric Frequency Increased Generators. Once the noise is picked up, an energy harvester converts the vibrations to <a href="https://inhabitat.com/the-voltmaker-charges-your-gadgets-off-grid-with-kinetic-energy/" target="_blank">kinetic energy</a>. Transducer cells then convert the energy to electricity, which is stored or distributed to the grid for regular electric use. 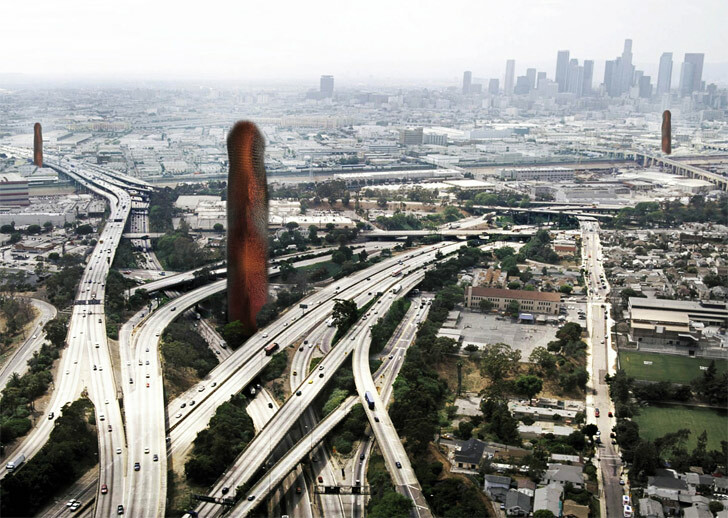 The team estimates that just one soundscraper could produce 150 megawatts of energy in a <a href="https://inhabitat.com/los-angeles-without-traffic/lasanstraffic2/" target="_blank">densely populated city</a>, which roughly converts to 10% of the lighting needs of Los Angeles. The clean energy would also help the city reduce carbon emissions and reliance upon fossil fuels. 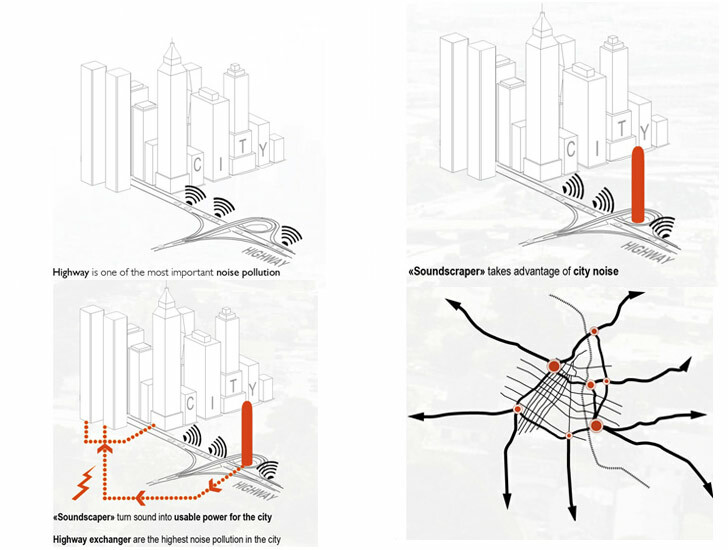 Several soundscrapers could drastically offset the electrical needs of a metropolis. The Soundscraper is a futuristic structure designed to transform auditory vibrations from bustling cities into a source of clean energy. 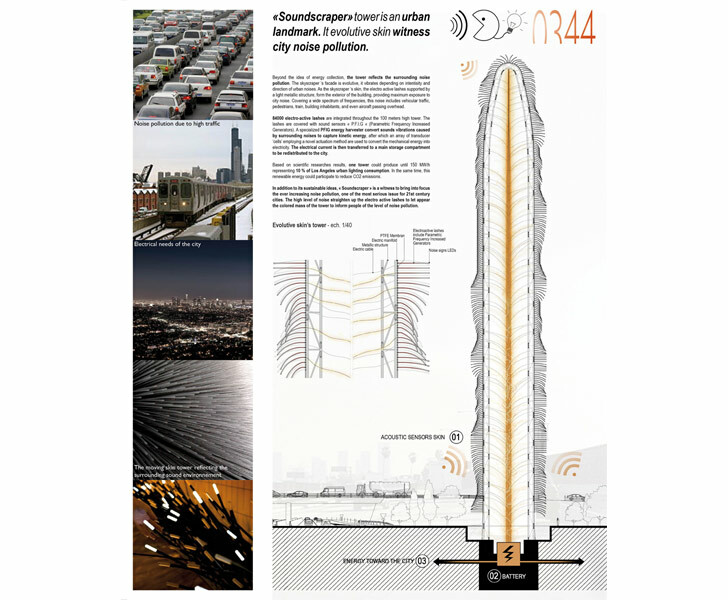 Designed by Julien Bourgeois, Olivier Colliez, Savinien de Pizzol, Cedric Dounval and Romain Grouselle, the Soundscraper is covered with noise-sensitive cilia that harvest kinetic energy while soaking up urban noise pollution.